Since I’m a lover of animals, both real and mythical, choosing an animal form that I would have the ability to shape-shift to is a nearly impossible choice for me. There are many animal forms that are majestic, beautiful and powerful – which really sums up the whole reason I would want the ability to shape-shift in the first place. Aside from the fact that it’s a magical ability, and we already know how receptive I am to magic in general, there’s simply something about being that closely connected with an animal form/spirit/guide that I personally find enticing. In an attempt to prevent this article from turning into a book of it’s own, I’m restricting myself to exploring three possible animal choices! Those would be dragon, wolf, and horse… nope, make that four, tiger as well, since this is my Chinese Zodiac animal. For me, dragons are the be all of magic. They’re majestic, powerful, graceful and simply to be revered. I know there are all sorts of tales and variations of dragons in literature across the decades. But for me, I’m drawn to the best of everyone and everything. I rarely see the darkness even in dark beings. So when you strip away all the potential badness that goes with the image of a dragon, you are left with pure magnificence. His scales glisten like diamonds; his claws are massive, sharp talons; his wings are perfectly symmetrical with an elegance to them that almost makes them seem delicate; even his tail is deceptively beautiful though it doesn’t take much imagination to know the damage that could be done with a simple flick of the spiked tip. So hands down, with the magic, flying, fire-breathing, power and grace – dragons would be my first choice. Having said that, I’ve always felt a profound connection to wolves, horses and tigers for various reasons. Horses have been one of my passions since before I was old enough to walk, that simply grew as I grew. The Black Stallion movie and book series were my go-to for years. I’ve owned horses pretty much my entire life and their wisdom and intelligence fascinates me. They’re incredibly loyal and let’s face it – Unicorns are horses too, which brings us back to magic! 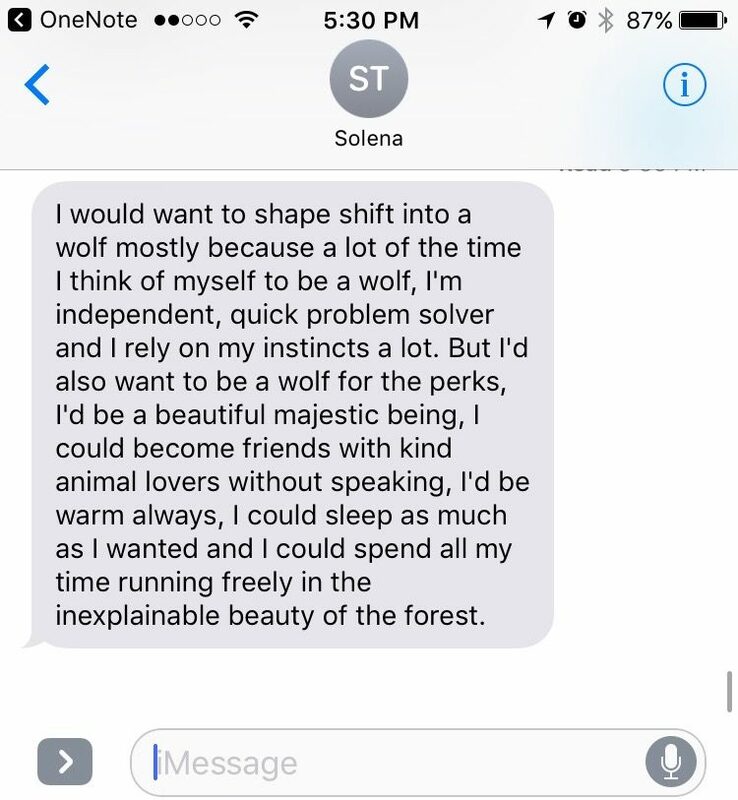 I’m not sure that I can explain my connection with wolves. It could perhaps be related to the fact that my parents bred Malamutes when I was a child and they were my real-live-teddy-bears as well as my protectors. 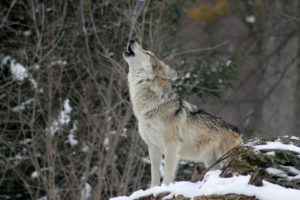 People often relate wolves to loneliness, but the reality is that wolves travel in packs and there is something deeply admirable about the leader of the pack who tends to rule fairly but firmly. I’m also very drawn to their protective nature, as I too am a protector. 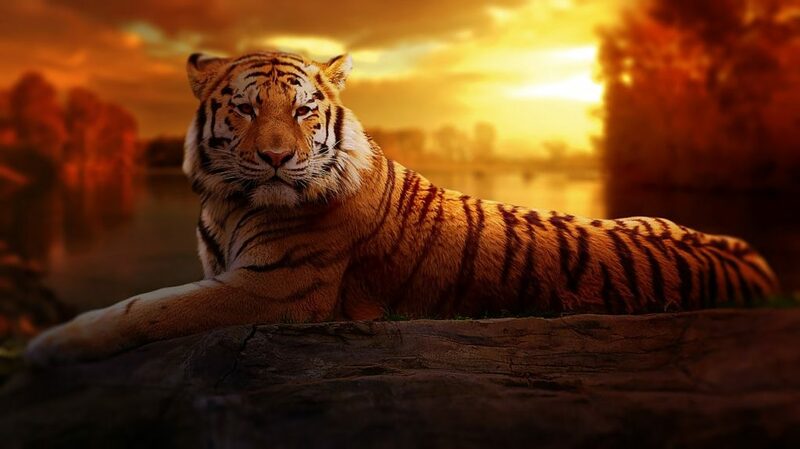 Then we have tigers, which clearly I have a connection with because of the Chinese Zodiac. Since I’ve always been drawn to both the Western and Chinese Zodiacs, I’ve read a fair bit of literature on being a “Tiger” and in fairness, the vast majority of the descriptions associated with being a “Wood Tiger” are very accurate, so there is a level of logics behind being able to shape-shift into tiger form. But even after speculating on all four of these, I still come back to dragons. So maybe this really wasn’t as nearly impossible as I first thought it would be! If you could shape-shift, what animal form would you choose? She never ceases to amaze me. Those are 100% her words and insight – and to think, I’ve had two people try to suggest to me that the voices of the teens in my novel aren’t realistic… Anyone who has read my first book will very likely feel a slight draw to the text above, since it’s been the teens in my life over the years who have significantly influenced my writing. But I digress (she just truly amazes me at times…) – getting back to shape-shifting… what would be your animal form of choice? ← Never be late again with Teleportation? Hmmm…my Chinese zodiac animal is rat. I’ll give that a miss, I think haha! I don’t really like cats as pets. I think they’re a bit arrogant and self-serving. To be a cat, though, that’s a whole other ball-game. Certainly of all the domesticated animals, they’ve got it the best. They can come and go as they please – most have even got their own little door. They don’t have to go out into the snow and rain to pee. They get fed and fussed whenever they so desire but when they don’t, they have their own independent lives. They often even have 2 or 3 homes to choose from, 2 or 3 families, and 2 or 3 sets of feeders/fussers 😉 I think cats have got the best of both worlds – the comforts of domesticity and freedom and independence. 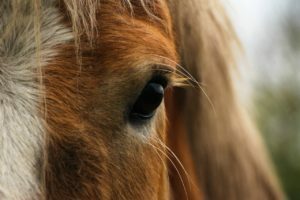 A horse – I used to gallop around pretending I was one when I was a child. One of two if I could shape shift I think a dragon cause they can fly and breadth fire. Or a lioness they are fierce and protective.